On Thursday 25th October 2018, the London School of Economics and Political Science (LSE), Department of Sociology hosted its annual British Journal of Sociology (BJS) public lecture. The lecture, by Professor Michèle Lamont from Harvard University was entitled, From “Having” to “Being”: self-worth and the current crisis of American society. The lecture focused on diagnosing the challenges of neoliberal American society: the pitfalls of the American dream across classes, hardened group boundaries, and the need to invent new narratives of hope. The lecture is freely available to listen to and download here. 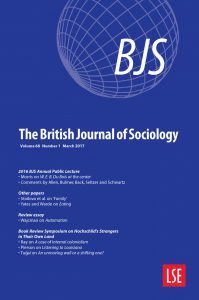 Along with a set of responses from other scholars within the field, the lecture will form the central article in a special issue of BJS in March 2019. The special issue will be accompanied by an exclusive interview between Professor Lamont and Professor Nigel Dodd from the LSE Department of Sociology. The BJS Annual Public Lectures provide a platform for leading sociologists to set out their own vision of the most significant questions and debates in their own area of the discipline. The aim is to offer BJS readers a clear overview of the ‘state of the art’ in a particular field of sociology, as well as a well-rounded and balanced sense of what the most controversial issues might be. All previous lectures, along with the accompanying interviews and links to the BJS articles, including 2016’s lecture by Professor Alondra Nelson on The Social Life of DNA can be found here. Established in 1904, the Department of Sociology @LSEsociology at LSE is committed to empirically rich, conceptually sophisticated, and socially and politically relevant research and scholarship. Building upon the traditions of the discipline, we play a key role in the development of the social sciences into the new intellectual areas, social problems, and ethical dilemmas that face our society today.